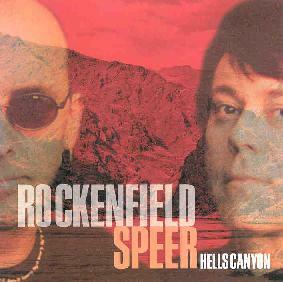 Rockenfield / Speer - "Hells Canyon"
Scott Rockenfield is the drummer for Queensryche and Paul Speer is a musician and producer who have teamed up to create a set of guitar and percussion driven progressive rock. Rockenfield also plays keyboards. I can't say I've heard much of Queensryche's music but this is a far cry from the metal that band is known for. The music is characterized by driving rhythms backed by dark choral chants that at times reminded me of Camel and Steve Hackett, maybe a dash of Holdsworth. But the music is darker and heavier than any of those analogies, while at the same time incorporating elements of ambient and New Age. That probably sounds strange but the combination of styles that makes up the trademark sound throughout this album is difficult to describe. Speer is a impressive guitarist but rather than being spotlighted as a shredder his guitar works in tandem with Rockenfield's drumming to keep the pace zipping along. And the orchestral choir, which is prominent throughout most every track, gives a heavenly symphonic feel and majesty to the songs that I enjoyed. Among the standout tracks is "Chant Of The Fathers", which features an intense tribal feel and full deep low-end sound that pounds the eardrums. The chants really work well on this tune giving it a more grandiose atmosphere. A solid rocker. "Snake Dance" is a still rocking, but more ambient piece, with some keyboard sounds that are common to meditative New Age music. But the drums are still driving away and Speer's playing just jams along laying down nice melodic licks. "Crossing To Freedom" is similar but with a heavier rockin' edge. "Coyote" includes dancey electo-rhythms, and "River Of No Return" does too, though it's more of a rocker with jamming guitar licks to go with the dancey electro bits. And "Buffalo Eddy" is a little different being a bit on the bluesy side. In summary, prog rock fans who like proficient but tastefully played guitar and solid rhythm will enjoy Rockenfield / Speer. It took me a few listens to tune in because most of the songs sounded the same at first, but after a while it became apparent that there are both subtle and overt differences across the tracks. For more information you can visit Rockenfield / Speer at Paul Speer's web site. Several tracks are available to hear at their Mp3.com web site.